What a wonderful time we had in Colorado!!! Nearly 60 Yangchun families gathered to celebrate our daughters' birthplace and our common connection. Here's the photo taken Saturday morning of the entire group. What a sight it was watching the photographer coordinate this shot! It was a very busy, fast paced weekend, with fun activities for everyone. Most families began to arrive at Snow Mountain Ranch on Friday. There was a hayrack ride that afternoon, and some time spent at the petting zoo. That evening was the first official gathering of our families with ice cream sundaes, many different craft projects, ribbon dancing, and the making of a beautiful handprint mural for the orphanage. Saturday morning began with introductions of our special guests, Yu Hong Ying (the orphanage director) and Chen Ju Ying (Yangchun City Civil Affairs). We saw a video of Yangchun and the orphanage and made a giant red thread web as a way to introduce the families. After the group photo, it was time for our picnic lunch. This included face painting, bubbles, ball games, tattoos, and general fun for the kids. The afternoon held a traditional dance demonstration by Moon Lee (a professional actress/dancer from Hong Kong); a parenting seminar by Yangchun mom, Betsy Edmonds; and a question and answer session with Mrs. Yu and Mrs. Chen. The day concluded with a barbecue dinner, a wonderful sing-along, and more dancing. By Sunday morning, it was time to say good-bye to our new friends, as everyone began to head for home. It was a great weekend, and hopefully, it was just the first of many Yangchun Reunions. Below are links to some photos of our great weekend. If anyone has photos they would like to share, please feel free to email me. After the reunion, Mrs. Yu and Mrs. Chen took off for a tour of various cities around the U.S. In each city, they were hosted by Yangchun families and had the opportunity to see many of "their" kids. The ladies had a wonderful time on their trip, and it was very special for all the families who got to spend time with them. Here are links to a few photos of their time in the U.S. Many Yangchun families donated to a travel fund for Mrs. Yu and Mrs. Chen's trip to the USA. We collected far more money than was needed for their travel, so it was decided to use the remaining money to benefit the orphanage. It is hoped that a hugging granny program can be established very soon. But in order to do some good at this time, several larger toys were purchased for the orphanage in October 2000. Here are photos of the toys that will soon be delivered to Yangchun. 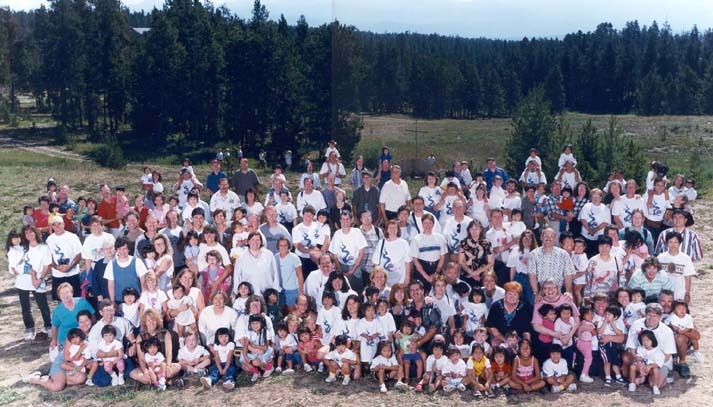 * Visit the Yangchun Adoptive Families website maintained by Lisa McClure. This site has many links to information about Yangchun, along with photos of Yangchun babies and the old orphanage. * Visit the Yangchun Children's Photo Gallery to see lots of beautiful children. * Meet just some of the families with children from Yangchun in the Family Gallery. * Join the Yangchun Families Email list. This is a low volume list where families share referral/travel news and exchange information specifically about our Yangchun kids.